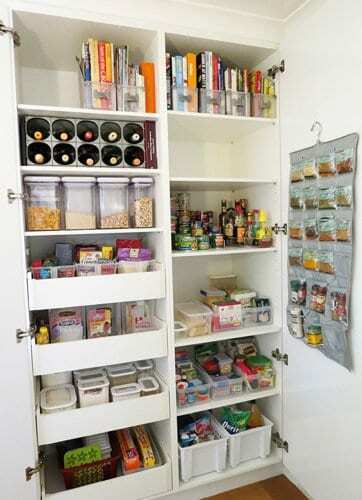 Hands up if you need help with how to organise your pantry? Oh yes, all too often that space in the kitchen can turn to chaos pretty quickly with such frequent use. The kitchen is one of the most high traffic areas of the home, so the pantry and fridge definitely work hard! 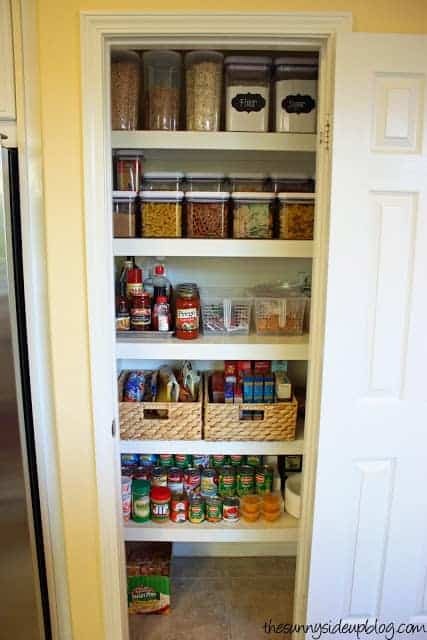 With food and cooking supplies going in and out on a daily basis, if you don’t have a great pantry organisation system in place, you will find yourself back to square one in no time! Trust me, I have been there! And it wasn’t pretty. Not only that but if you haven’t gotten your pantry organisation sorted, you will end up wasting time in the kitchen, trying to find the things you need, instead of just getting in and getting the job done. Ain’t nobody got time for that! 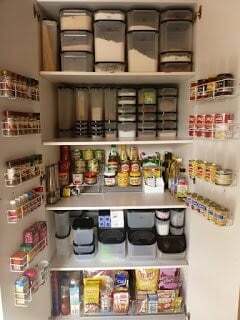 To help you organise your pantry, I have found some of the best organised pantries from around the web to inspire you to get your own up to scratch too. One thing most of them have in common are those gorgeous black chalkboard labels for pantry organisation so you know exactly what is in each container. It looks on trend and functional of course too! You also need the right containers or baskets. I like stackable containers the best for my dry pantry items such as flour, sugar, baking essentials, etc and tall containers for cereal. The idea of baskets or containers to keep small items in one place is perfect too! If you have joined the Simplify My Life challenge, you may have embarked on the big kitchen declutter and found some great kitchen organisation ideas to help you out. If not, that’s okay too. Plenty of time to catch up. For my own pantry, I have shelves dedicated to different types of goods. Eye level is cereals, grains & things like coffee, tea etc. These are the things we use every day. Next one down is all the meal related stuff, like spices, sauces, packet and tinned goods and related products. The bottom shelf is baking supplies and snacks, and we have a tub with school related snack items for easy access too. Then my floor level has the bags for potatoes, garlic, onions, plus where we store things like cat food, kitchen supplies and extra large items. I also use the top shelf of my pantry for storing party supplies like paper plates, cups and plastic cutlery as well as a couple of tall appliances that don’t fit in my normal kitchen cupboard spaces. It’s pretty high so I need a chair to get up there and retrieve stuff so it is irregular use and special occasion items only. I would take a pic but my kitchen area has poor natural lighting so it wouldn’t be the best of photos. You will just have to take my word that it is looking pretty snazzy at the moment… although still room for improvement (Hello trip to Ikea). If you need extra inspiration, this book is a must read! The KonMari Method is perfect for getting every part of your home decluttered and organised and the kitchen pantry is one of those clutter hotspots… anyone else have food expired 3 years ago? I’ve been guilty of this! How do you organise your pantry? Do you have any great tips to share? 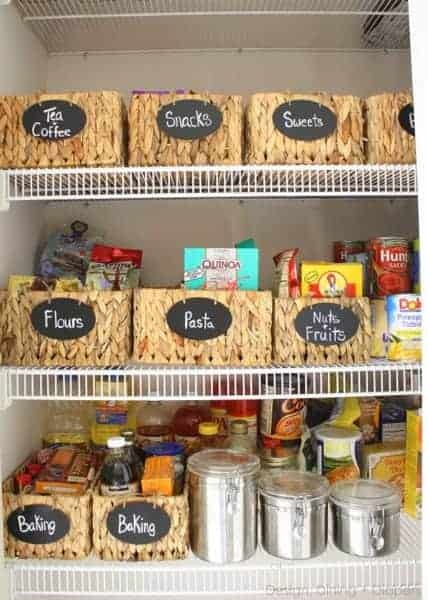 Organized pantries are my favorite pictures to drool over. Thanks for the roundup! My pantry is a jumbly lump. These posts inspire me to get organized to save me time not rummaging around for ingredients and money when I go rebuy something I can’t find. 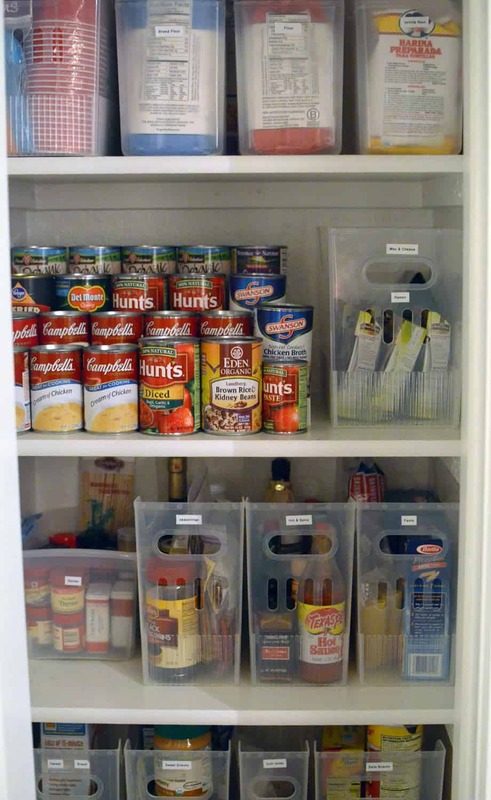 Wow, such great pantry organization! I could really use some of these tips. I just bought a couple glass containers for my bulk baking items, but everything else is a little chaotic in there. That’s a very good start though. 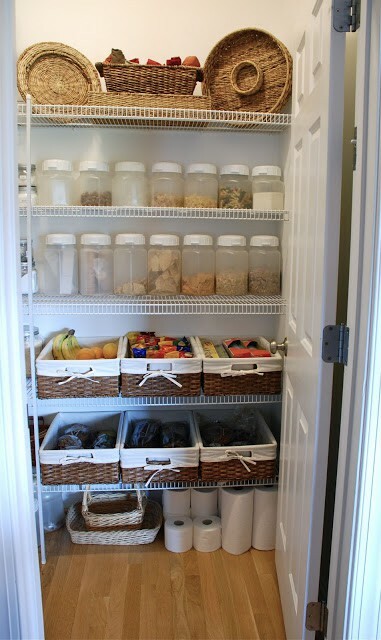 Glass containers look so nice in the pantry, plus you can see the contents! 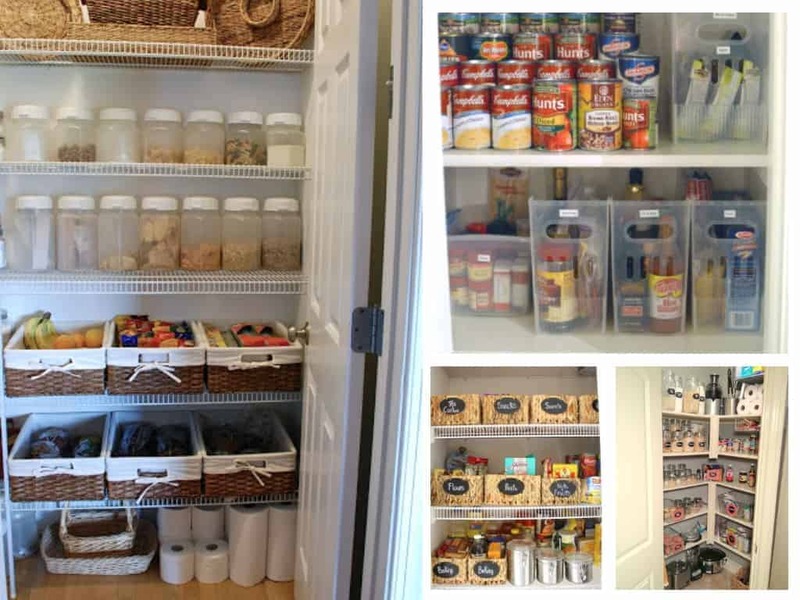 oh wow, those pics give me some serious pantry envy. A task I have to do! Thanks for linking up! Clear containers are a must! And I must get some more. I keep envying all the hanging spice racks too. Hanging spice racks are such big space savers. I want one of those! Great inspiration here! Thanks so much for coming by the #HomeMattersParty – we hope to see you again next week! Thanks for sharing your inspiration of organization, my dream is to have a pantry that is as big as a room, where I could have appliances there where I would have access to all the goods in the pantry at a reach. Join us for The Oh My Heartsie Girls WW this week!!! Great inspo. Mine never stays neat for long! I am lucky though that we re-did our pantry and have drawers on the bottom, two large and one small in which is havr cans laying down. And then doors on the top half with shelves. The drawers are awesome. I am in desperate need of a spice rack of some description though! Those drawers sound fabulous Steph. I have spice rack I can slide in & out. It’s not ideal but the best I have for now. 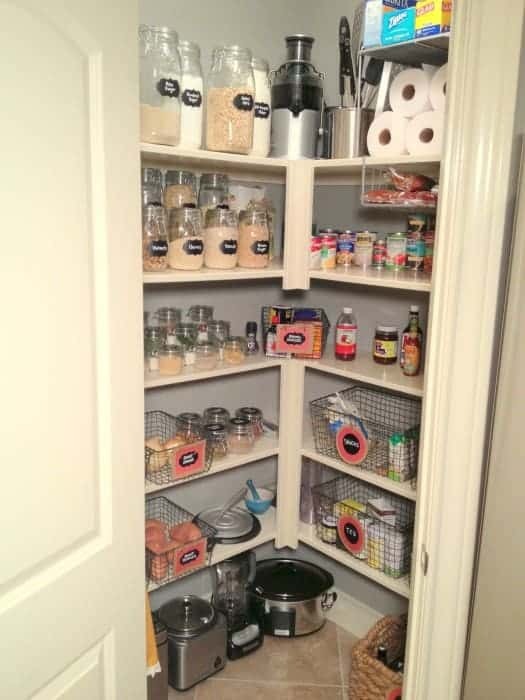 Thank you so much for sharing my organized pantry! I really appreciate it! I’m sorry this response was so late. I haven’t been blogging for awhile. We’re building a beautiful new house and I’ll be sharing how I’m organizing all of the new spaces. good organiZation. Just thought about the stacked cans- always have to half-empty the cupboard to see what is in back- ever think about putting the cans in the cupboard ‘upside down’? Most of the names of the contents are toward the bottom of the cans.